Wishing you a restful day. Tagged blog hop, cat, cat photos, Christy, Echo, Wordless Wednesday. Bookmark the permalink. Awww I love seeing kitties, we have 2 but they dont frequent their tree much, especially together. Kinda like bunk beds right??? Happy snoozing! It seems it’s nap time! Sweet dreams! Nap time, one of my favorite times of the day. 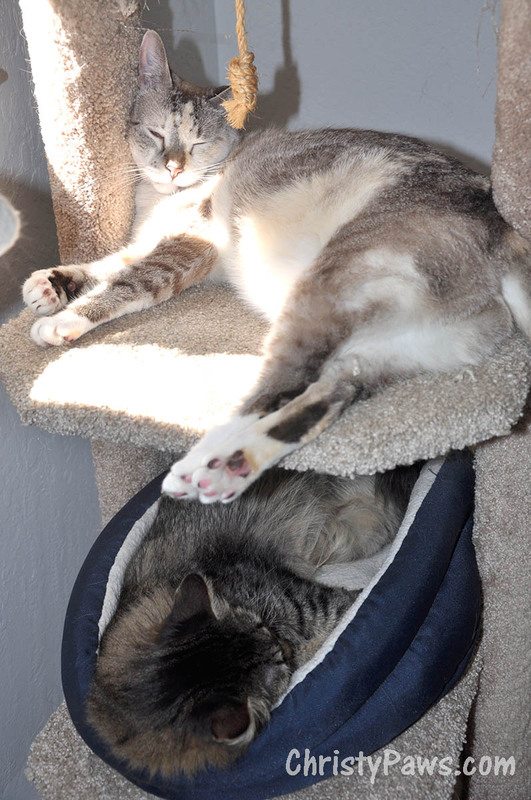 Double decker nap. What a great napping spot for both of you. Cute! We do dat all da time! Sometimes even triple-decker! OMC Y’all look sooooooo adowable. Have a gweat day. Awwww! You two are so cute! It’s great that you found a comfy spot that you could nap together. I hope you had wonderful dreams. Christy you are relaxed right outta your tree, my friend. guys…a grate fotoz….. & mite we add… ya noe what elze iz grate aza double decker….a perch samich !!! That looks like a nice, cozy snooze for both of you. Hey Christy you look so reeeelaxed. Great! Just posted on Facebook about it! Well those two sure look comfy and having a great day. Take care.